Upgrade! Tijuana rescheduled for Wednesday, May 13th! Come out and join us at Lui Velazquez in Tijuana on Wednesday. I’ll be talking about Becoming Dragon and performing some new poetry. 1ro Piso, Int. 6, Colonia Federal. Come see a discussion of Becoming Dragon and the Transborder Immigrant Tool, along with a few other amazing new media projects on April 29th at Lui Velazquez! 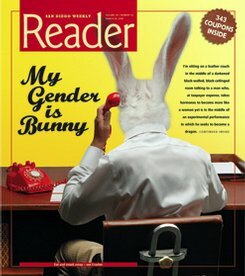 Guess who’s on the cover of the San Diego Reader this week? ME! So pick up a copy and check it out, or read it online here and leave the author a comment! I’m very happy, and very annoyed with this article on the cover of this week’s issue of the major San Diego weekly publication. I’m happy that the project is getting so much exposure. I’m very unhappy that the author chose to ignore my choice of pronouns, present the whole project as some mad scientist project “at tax payer’s expense” and put a ridiculous picture on the cover instead of one of the many photos and second life screenshots from the performance. At least the author had the courage to admit at the end of the article that I told him what pronouns to use and that he chose not to. Overall, I think that he quoted me at length, and accurately, on the core issues on the performance, which I really appreciate. Also, if you’d like to see documentation of Becoming Dragon, life size, up close and personal, come to Open Studios at UCSD next Saturday, April 4th!